This stitch was published in “Newest Lacy Stitches”, The Australian Woman’s Mirror, November 1st, 1932. 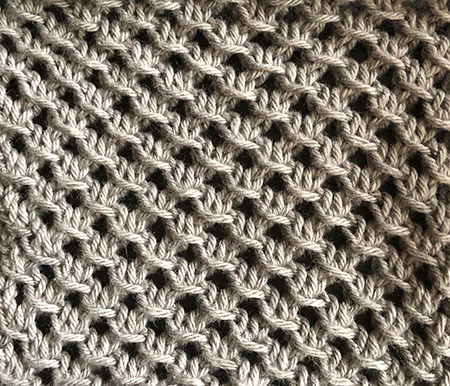 This stitch was also popular with Victorian knitters, worked on larger than normal needles and lace-weight wool, to form the centre of shawls. Row 3: *Sl1-k2-psso, yo, repeat from * to last st, k1. Rows 1 to 4 form the pattern. Repeat for the desired length.